The Opposition has been shocked by the naivety of the government MPs, who continue to be brainwashed by the Prime Minister Peter O’Neill’s serial lies. “It is appalling to know that most MPs behave as if the country’s affairs are prudently managed by the Prime Minister. “Are we making wrong normal in this country? Are we allowing lies as a normal thing? The Opposition says No,” he said when commenting on the Prime Minister, who always deviates from answering questions at the floor of Parliament. He said ‘a lair must always remain as a lair’ and that he or she must be prosecuted, adding the leadership must be taken rid of consequently. 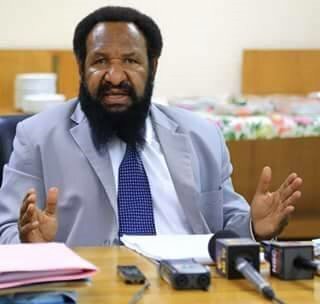 Polye has urged fellow citizens and MPs to stand up on what is true. “We must be emotional about it. There is a good anger and there is a bad anger. “We must get angry to defend what is right,” he said. He added that the Opposition is angry because the country has a Prime Minster, who is a serial lair. Mr Polye has expressed concerns that the young people will tend to think that telling lies is normal. “It is also painting a bad picture to the outside world as they may think that all of us are lairs or we produce Prime Ministers who are like O’Neill. “I am worried that they might think that we are bunch of lairs. The Prime Minister is lying and getting away with it so they will think that other Papua New Guineans must be lairs too,” he said. Polye further said the team, which he led, stood on the values of honesty and truthfulness. “We are talking about a much bigger issue. The Prime Minister is just openly lying as, for instance, I have got evidences or documents to prove that he has tied the LNG proceeds to an Escrow account in Singapore to service the UBS loan. “You know that Mr O’Neill once said the proceeds were kept in the Central Bank. The bank confirmed that there was no money there,” a concerned Polye said. He said his motion to table the documents at the floor of Parliament was voted out, adding the MPs in the government rejected the truth.